Will the Ocean Circulation Be Unbroken? If the world’s climate is going to change, we will see signs in the ocean. The atmosphere and oceans are intricately linked; nowhere is that better demonstrated than in the North Atlantic Ocean, where current systems carry great volumes of warm and cold water into and out of the region, creating a critical turnaround point in the global circulation of the oceans. In the tropical Atlantic, intense sunlight warms the ocean, while dry trade winds cause surface waters to evaporate and become saltier. The Gulf Stream carries this warm, salty water north along the U.S. East Coast and then toward Europe, before it transitions into the North Atlantic Current and heads north. As this water reaches higher latitudes, it releases heat to the atmosphere, tempering winters in the North Atlantic region and leaving behind saltier, cooler, and denser waters. These transformed waters sink to the depths and form the Deep Western Boundary Current, which flows southward along the East Coast—beneath the northward-flowing Gulf Stream—and into the South Atlantic. 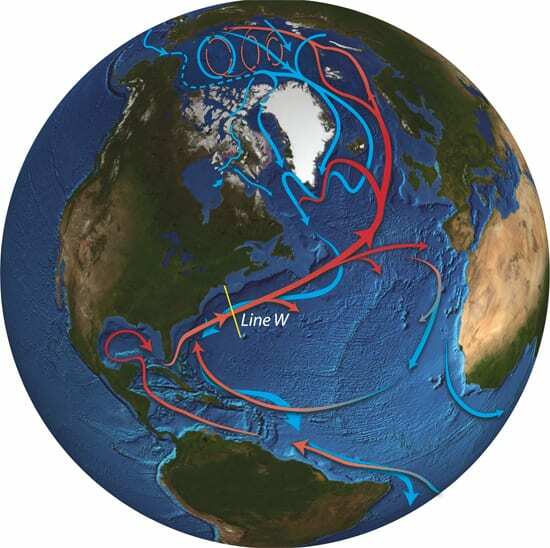 This process of sinking and southward flow draws more warm water northward to replace it and contributes to a worldwide circulation pattern sometimes referred to as the Ocean Conveyor. For decades, scientists have sampled these currents to gain a fuller understanding of the North Atlantic’s critical role in influencing regional and global climate. But they have been limited by their inability to get more than point measurements—that is, observations in one geographic place at one moment in time (a day, or maybe a month, but rarely longer). To help remedy that situation, Woods Hole Oceanographic Institution researchers established a long-term observing system on the continental slope south of New England, where the Gulf Stream and Deep Western Boundary Current align roughly like an artery and vein in the Atlantic Ocean circulation system. Combining an array of moored instruments with shipboard observations, the “Line W” program has been directly measuring the properties and variations of these two currents between Cape Cod and Bermuda. Line W is named for Valentine Worthington, the late WHOI physical oceanographer who devoted a considerable part of his career to measuring and understanding the system of currents in the North Atlantic. 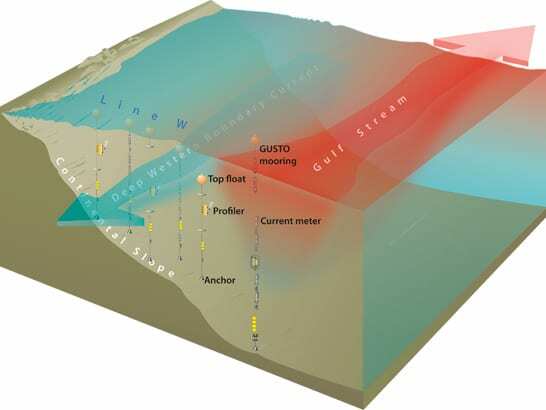 Building on the work of Worthington and other pioneers, WHOI physical oceanographers John Toole, Terry Joyce, Ruth Curry, and Bob Pickart, as well as Lamont-Doherty Earth Observatory geochemist Bill Smethie, are working to chronicle variations in the Deep Western Boundary Current and Gulf Stream. Does the volume of water in the current change from year to year? Is the water growing warmer or cooler, fresher or saltier? And what are the consequences of such changes for the exchange of heat and moisture with the atmosphere and for the circulation of the entire Atlantic? In the 1950s, researchers from WHOI and the Bermuda Biological Station for Research began a long time-series of water measurements at Station S, about 15 miles off the coast of Bermuda. Every two weeks since June 1954, researchers have returned to that spot in the middle of the Sargasso Sea and measured the water properties from the surface to the depths. 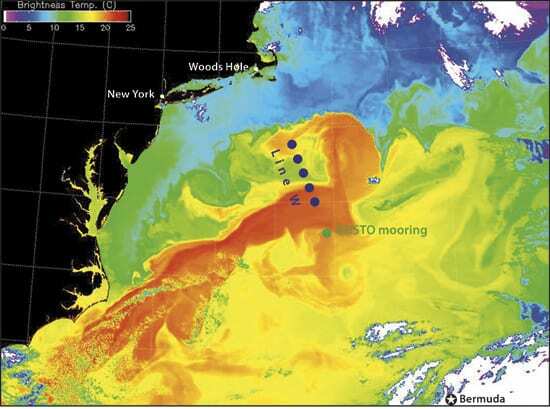 That long-term data set has proved invaluable for giving broad views of the Gulf Stream, the layering (or “stratification”) of the ocean over time, and other aspects of Atlantic circulation. Following the Station S model, WHOI scientists launched the Line W effort in October 2001 with the placement of a single mooring about 320 kilometers (200 miles) southeast of Cape Cod at 39°N 69°W. That initial effort, funded by the G. Unger Vetlesen Foundation, was called Station W. In 2003, having proved the value of the concept to the National Science Foundation, the researchers secured funding to add four additional moorings and to make twice-yearly ship-based observations in the area over four years. The Line W array was installed in April 2004. Three of the five moorings in the array support “moored profilers,” which crawl up and down a steel mooring cable, carrying sensors that continuously measure the temperature, salinity, and velocity of water from the surface to the seafloor, storing the data in computer memory. The other two moorings have individual sensors distributed in the water column to take long-term measurements at key points. The Line W array records the velocity and layering of the Deep Western Boundary Current, while also documenting the intensity of the Gulf Stream as it meanders. By design, the array lies directly beneath the track of the Jason ocean-observing satellite, which measures features of the sea surface over Line W every 10 days, complementing the underwater measurements. Line W is one component in a long-term, international effort to observe most of the critical regions of the North Atlantic circulation system. In particular, it is linked closely to the United Kingdom’s RAPID Climate Change Programme, which has set a line of moorings northeast of Line W and another along a line stretching from Florida to North Africa at 26°N. WHOI physical oceanographer Michael McCartney recently established a separate but complementary mooring, positioned in the middle of the Gulf Stream and along the same satellite track as Line W and the venerable Station S. The Gulf Stream Transport Observations mooring, or GUSTO, is a hardy conventional mooring designed to measure changes in the strength and structure of the Gulf Stream over time. The new mooring is actually the second incarnation of GUSTO. 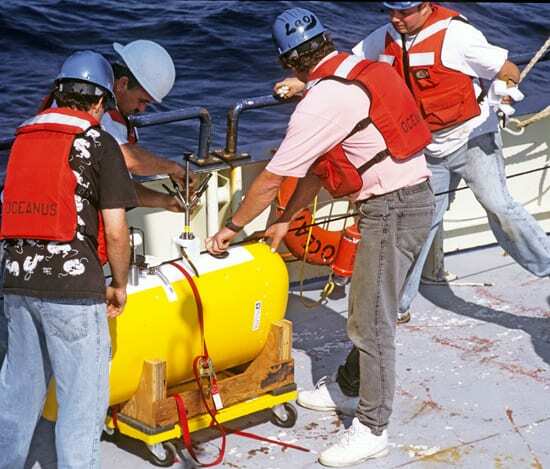 A previous version was developed and deployed in 1982 by McCartney and former WHOI physical oceanographers Harry Bryden, Dale Haidvogle, and Val Worthington. 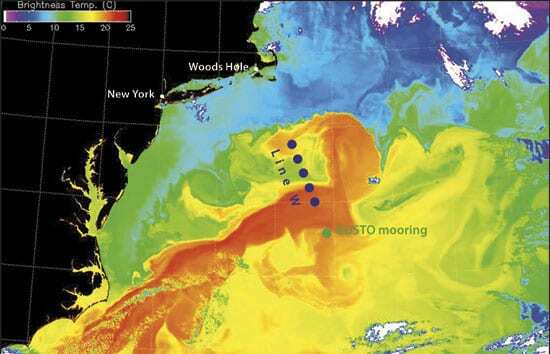 By combining data from the original GUSTO mooring, analyzed by former MIT/WHOI Joint Program student Mindy Hall, with those from the new GUSTO mooring—as well as observations from another Gulf Stream measurement program of the late 1980s (known as SYNOP)—oceanographers will paint a clearer picture of changes over the decades in the Gulf Stream. With three years in the water and one more to go, the Line W program has been amassing mountains of data about the day-by-day and season-by-season characteristics of currents flowing through the northwestern Atlantic. So far, the research team has observed interesting changes in waters at intermediate depth in the North Atlantic. These appear to relate to changes in the amount of dense, cold waters that scientists have observed sinking upstream in the Labrador Sea. The team also sees that since 2000, there has been decreasing salinity in the densest waters of the Deep Western Boundary Current at Line W—a signal, they believe, of fresher upstream waters spilling over the Greenland-Scotland Ridge into the North Atlantic from the Greenland, Iceland, and Norwegian Seas (see “Interrogating the Ocean Conveyor” and “Fresher Ocean, Cooler Climate”). Ultimately, integrating Line W data with other observing programs will advance understanding of how changes in the waters of the northern North Atlantic Ocean are propagated to lower latitudes, and vice versa, and how these changes affect the rest of the global ocean circulation. Researchers often point to changes at the poles as the proverbial “canary in a coal mine,” providing warning of global change. But the message could well be delivered by variations in the North Atlantic Ocean’s circulation, which should come through loud and clear at Line W.
Line W and Station W were made possible through the support of the G. Unger Vetlesen Foundation, the WHOI Ocean and Climate Change Institute, and the National Science Foundation. 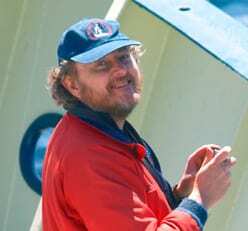 Line W collaborators include John Smith of the Bedford Institute of Oceanography, as well as scientists from the United Kingdom’s RAPID Climate Program, particularly Chris Hughes, Ric Williams, and David Marshall. Line W is an array of five moorings that has been monitoring changes in two currents that play important roles in regulating Earth's climate: the Gulf Stream (orange area) and the Deep Western Boundary Current hugging the U.S. Eastern Seaboard. Line W aligns with the GUSTO mooring, which is monitoring the Gulf Stream, and Station S off Bermuda, where researchers have taken ocean measurements every two weeks since the 1950s. Line W monitors currents at a critical junction in the global circulation of the oceans.